Pumpkin buttercream frosted pumpkin cake with a caramel and toasted pecan center. What’s not to love? Can we talk about the microwave for a second? Does anyone else struggle to keep their microwave clean, or is just me? I swear, no sooner I scrub the thing, somebody (ahem, Squirrel) blows their food up and I have to clean it all over again. I’ve tried numerous things to get Squirrel to quit blowing things up when he’s heating his food. I’ve recommended using a paper towel or napkin to cover his food. It’s not like he has to go far; they’re located right next to the microwave. I’ve even resorted to threats. Hey, desperate situations call for desperate measures. “If you don’t cover your food, I’ll stop feeding you. Do you want to starve?” That threat buys me a few days of covered microwave sessions, but, for the most part, it’s a futile effort. After a couple of days, it’s back to a microwave war zone. Chili splattered on the walls, sticky residue on the door, and food smears on the outside handle. Just the other day, I thought there was a spider in the microwave. I sat there and stared at it for a bit before I got the courage to fish a spoon out of the drawer and poke it. Nope, not a spider. It was just a crusty piece of microwave shrapnel. Maybe I need to start bribing him. 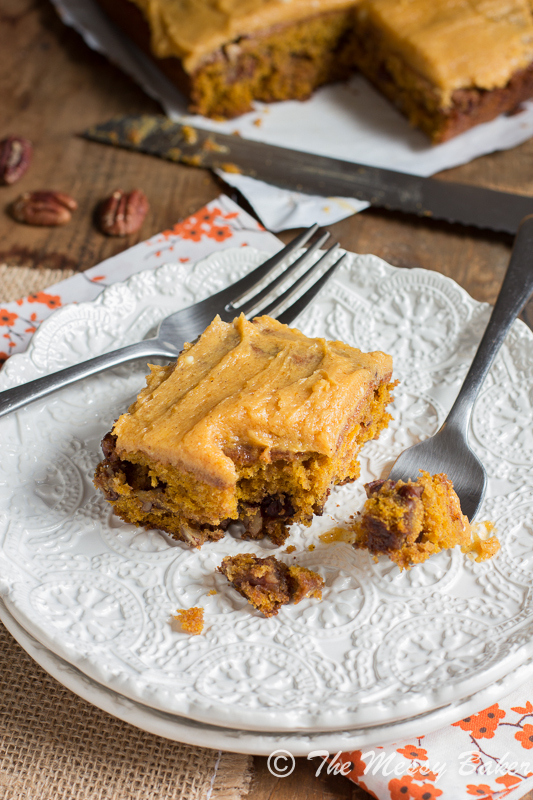 That’s where this pumpkin caramel pecan cake frosted with pumpkin buttercream comes in handy. Who can resist moist, melt-in-your-mouth cake topped with the creamiest buttercream ever? Surely no one that I know. Here’s an idea: maybe I’ll bribe friends and family into cleaning my microwave with dessert. Whatdoya think? Will it work? Remember the oreo cookies stuffed with pumpkin buttercream that I made last week? Well, I loved the pumpkin buttercream filling so much that I had to make it again and frost a cake with it. It’s the easiest buttercream to whip up, and the flavor is amazing. Think pumpkin pie in the form of buttercream. It’s full of warm pumpkin pie spice and pumpkin puree. It’s my new favorite frosting. Let’s talk about the cake. It’s a pumpkin cake with a caramel and toasted pecan center. Remember the apple cider bourbon caramel I made the other week? I used it for the sticky caramel/pecan center. As the cake bakes, the caramel gets absorbed into the layers, creating an extremely moist, melt-in-your-mouth texture. The toasted pecans are nestled in the middle, adding a lovely crunch. The crispy ends are my favorite part. I could cut off all the corners and dunk them in the buttercream. There is no need for a mixer; this cake can be whipped up in one bowl. I’m always looking for ways to get out of scrubbing numerous bowls and whisking utensils. If you are too, then this recipe is for you. One piece is good, but two pieces are even better. Enjoy! Preheat the oven to 350 degrees F. Grease and flour an 8-inch square pan. 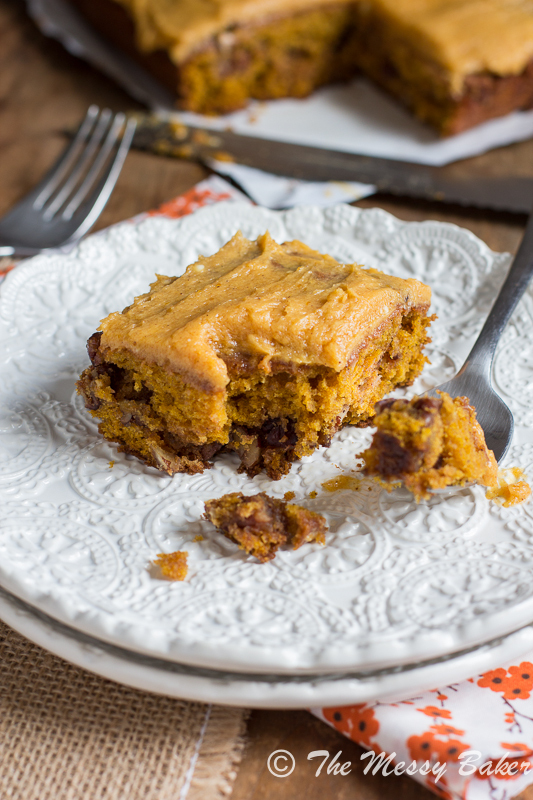 In a large bowl, whisk together brown sugar and pumpkin puree until smooth. Add the egg and vanilla extract and whisk until combined. Slowly whisk in the melted butter. Add the flour, pumpkin pie spice, baking soda, and salt to the bowl with the pumpkin mixture. Using a rubber spatula, stir in the dry ingredients until thoroughly combined. Transfer half the mixture to the bottom of your prepared pan. Spread the mixture out evenly. Drizzle with caramel and top with toasted pecans. Spread the remaining mixture over the caramel/pecan layer (it’s okay if some of the caramel/pecans peek through the batter). Bake for 25-28 minutes, or until a toothpick inserted in the center comes out mostly clean. Cool in the pan for 15-30 minutes before transferring to a wire rack to cool completely. In the bowl of your stand mixer attached with the paddle attachment, cream butter until smooth. Add pumpkin puree, pumpkin pie spice, and vanilla extract. Whisk until fully incorporated and smooth. Slowly whisk in the confectioner’s sugar. Beat until smooth and fluffy, about 2 minutes. 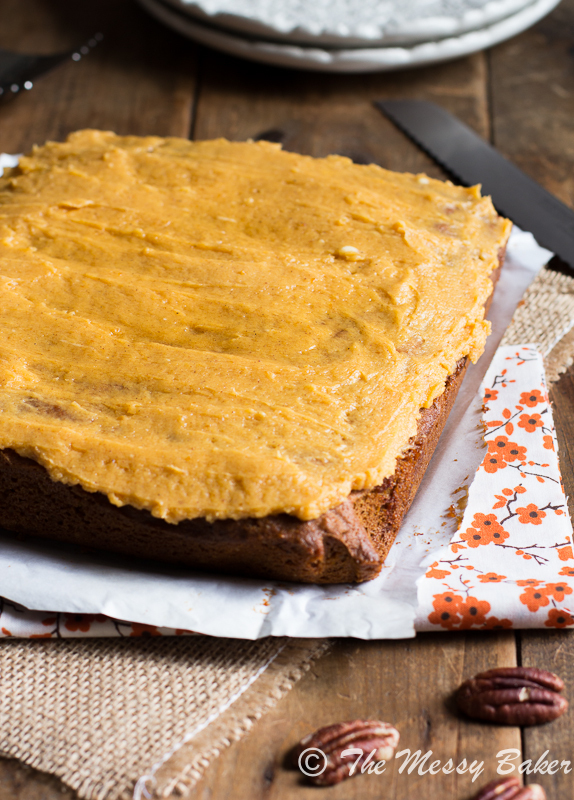 Frost your cooled cake with the pumpkin buttercream. 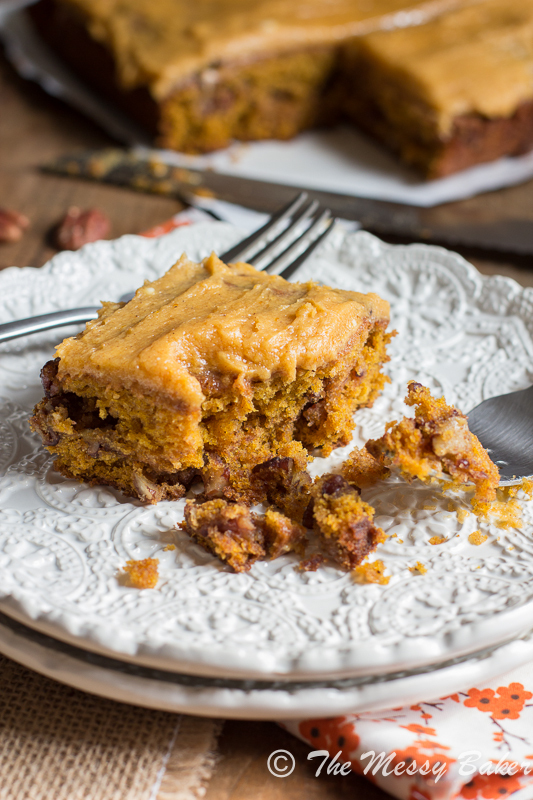 Moist pumpkin cakes like this are the best! So cool that you added caramel. And I’m still swooning over that buttercream. This cake looks awesome-I LOVE the idea of that caramel and toasted pecan center! My kitchen always has a dusting of flour coating the counters. Life of a baker. Thanks! This is fabulous! I’m drooling. And oh, the microwave. Sometimes I think I’m the only one in my house who can see the mess! Thanks, Dorothy. My husband is an expert at ignoring all things that don’t pertain to him. The microwave is one of those things. This cake would get gobbled down in 5 seconds flat in my house! SO much warm, fall deliciousness in that thing! I want a piece with my coffee! It was gobbled in no time at my house, too. Thanks, Julia! Dude, we go through the same struggle in my house! The microwave is always spotted and crusty, no matter what I do! 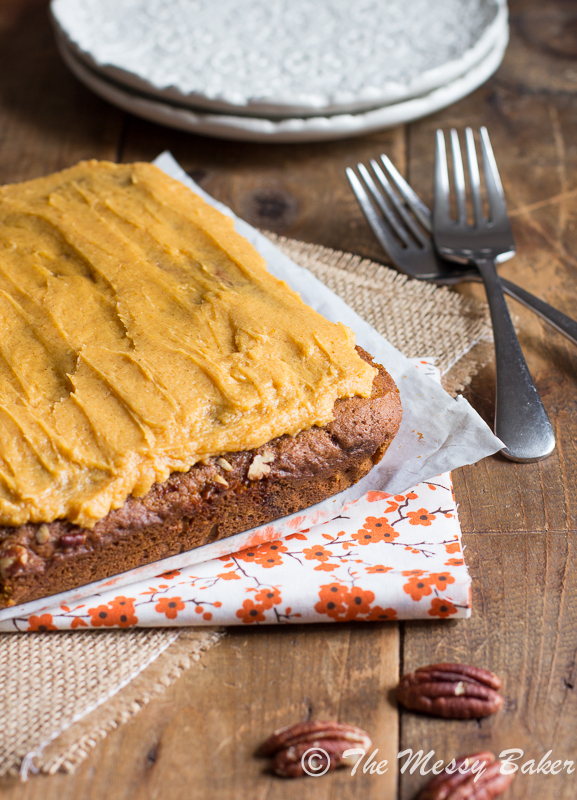 I would clean my microwave and yours for a piece of this chewy lovely caramel-y cake! I would definitely take these as a bribe ;) My husband is the worst offender when it comes to microwave messes. I wouldn’t care if he would just clean it up when he did it. But no, out comes the food and the door closes. As if it never even happened and I’m left to clean it up later ;) Too bad he doesn’t like pumpkin or pecans. I’ll need to find a different was to bribe him but in the meantime, while I think of ways to deter his micro messes I’ll give this a whirl and try not to eat the whole thing by myself! Kate, We’ll have to find some other dessert to bribe him with. Chocolate? What’s not to love is right! This cake looks irresistible! Bribe me with this cake, and I’ll come clean your microwave for you! Movita, that sounds like a good deal. If I were him, I’d take that deal in a second. Holy shizz, this cake looks incredible, Jennie. I love everything about it – I don’t think you can even fit anymore awesome deliciousness in there. I HATE cleaning the microwave. Unfortunately, it’s usually me making the mess. My specialty is heating butter for too long. When that stuff explodes, it’s a nightmare to clean. Do you have one of those plastic microwave cover thingys? Y’know, you pop it over your plate/bowl, whatever, and when food erupts, it just gets onto the cover? One of mankind’s best inventions. I’m constantly exploding butter. I need to find one of those plastic thingys then convince Squirrel to use it. Thanks, lady. I’ll clean your microwave for this cake. I used to have the same problem, but no more because we don’t have a microwave now! Problem solved! Susah, you have yourself a deal. I’ll send you home with an entire cake.